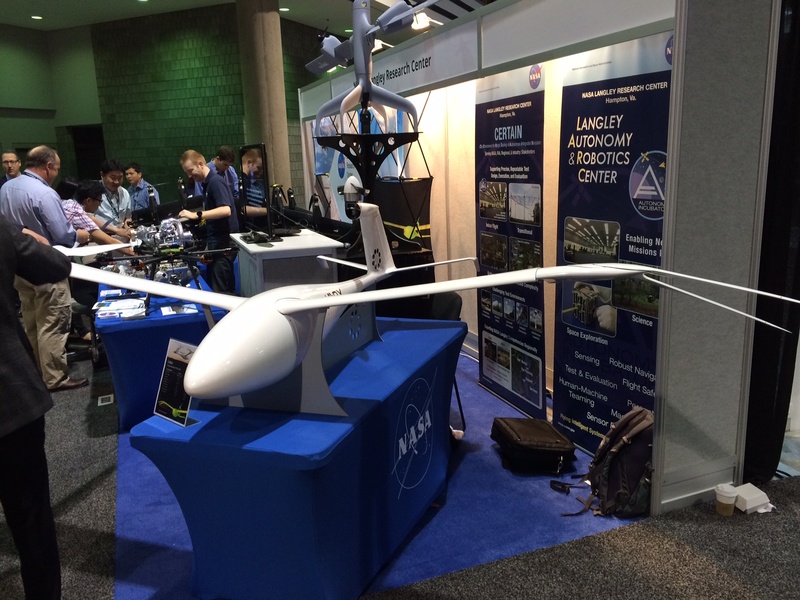 At a drone conference in Atlanta, everyone was looking for the next big thing in UAV design. 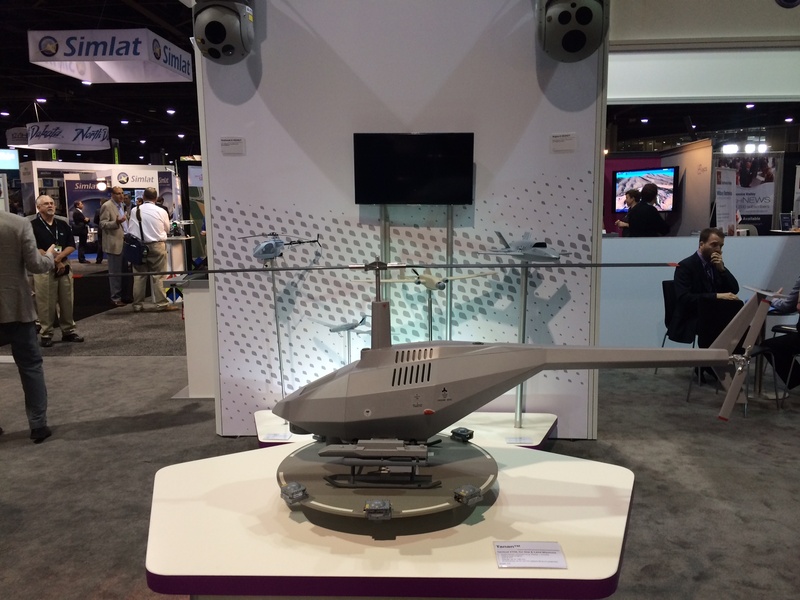 Here’s a look at some of the most interesting, innovative and outlandish drones Defense One came across. In the past year, drones have crashed onto the White House lawn, hauled radioactive cesium to the roof of the Japanese prime minister’s Tokyo office, and swooped above battlefields in Iraq and Ukraine . 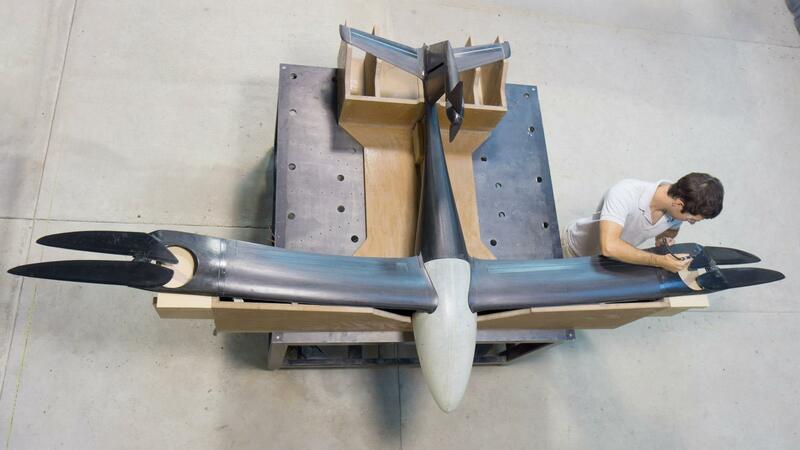 The future of drone design is an area with huge importance for companies and for the military . 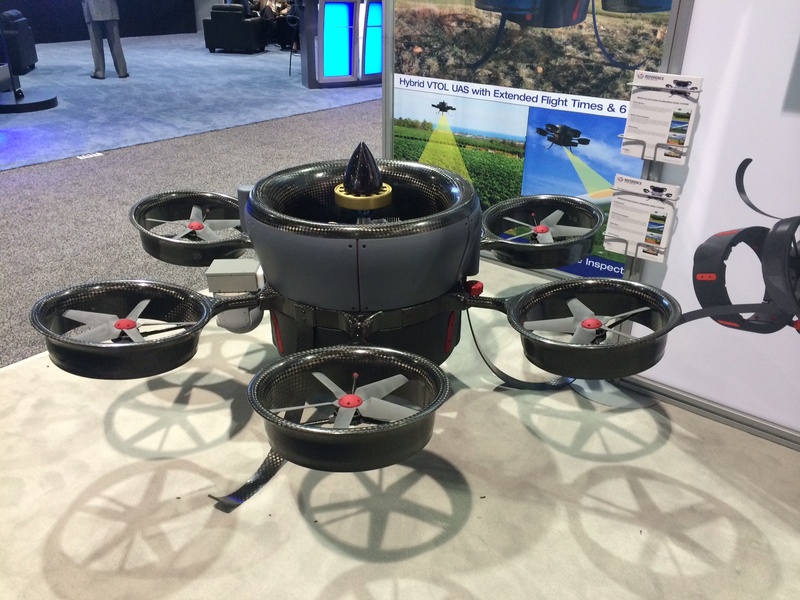 At the recent Unmanned Systems 2015 show in Atlanta, Georgia, that future was on display. 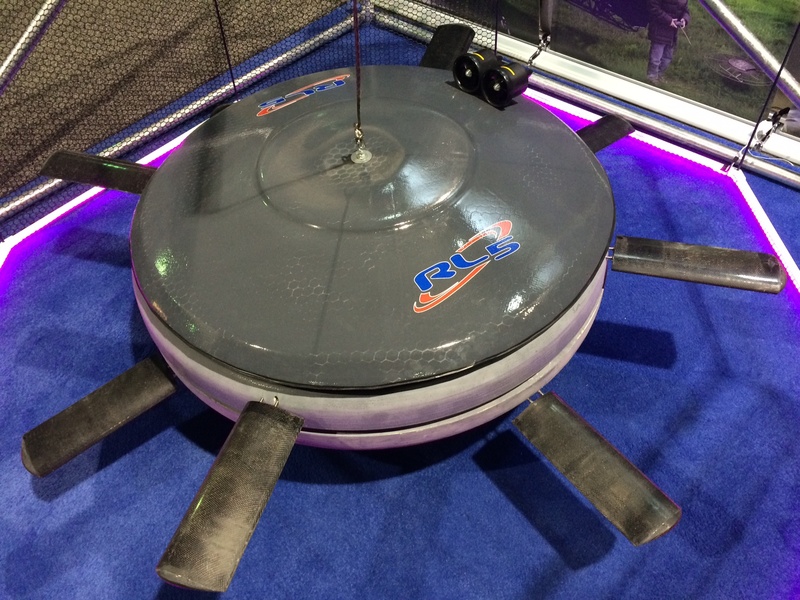 Hosted by the Association for Unmanned Vehicle Systems International, the show brought together drone makers, military types, and business leaders from around the globe. (Google founder Larry Page was spotted briefly on the showroom floor.) All were looking for the next thing in UAV design. 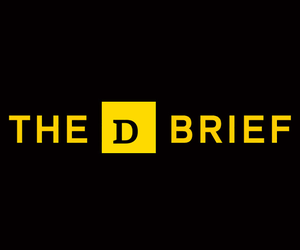 Here’s a look at some of the most interesting, innovative and outlandish drones Defense One ran across. 1. 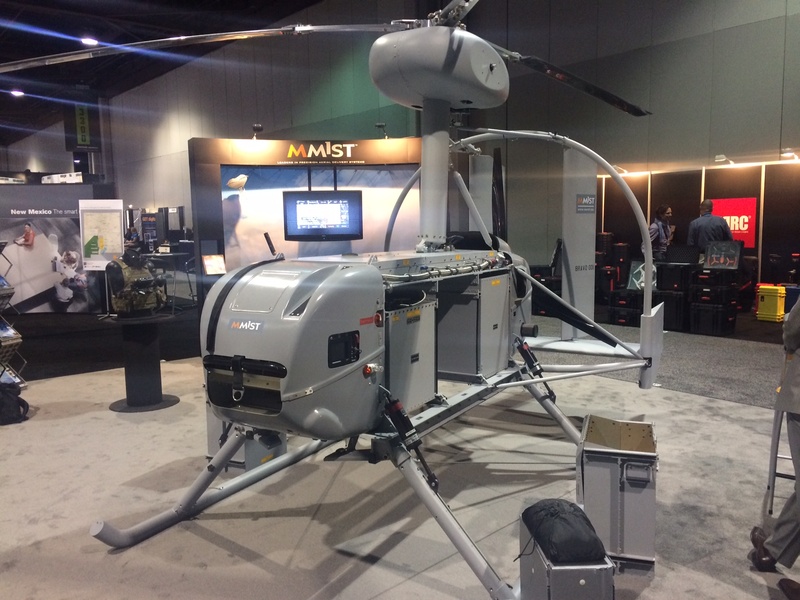 The SnowGoose BRAVO from Canada-based Mist Mobility Integrated Systems Technology , or MMIST, is an update to the company’s SnowGoose CQ-10A cargo drone. 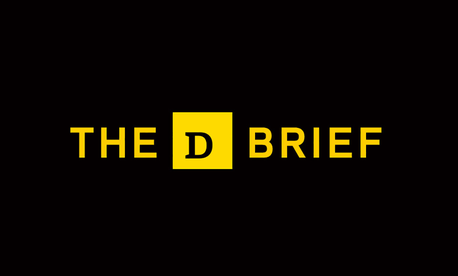 The original played a role in U.S. Special Operations Command missions for years. The Bravo may look like a helicopter with that big rotor up top, but notice the large back propellor? The SnowGoose is an autogyro, an aircraft whose rotor serves as a stabilizer while motive power is delivered to the propellor. Unlike a helicopter the main rotor of the BRAVO does not need mechanical power once the drone is flying. Before takeoff, shaft power is applied to the main rotor to get it spinning then the system hops into the air like a helicopter. The pusher propeller gets it moving forward to maintain rotor flying speed. MMIST president and SnowGoose creator Sean McCann said the SnowGoose BRAVO can carry 600 pounds of cargo, reach 18,000 feet, and accelerate past 70 mph. And it uses less energy than would a conventional helicopter design, he said. 2. There are two types of Hummingbird drones. First, the famous nature-mimicking AeroVironment Nano Hummingbird, developed under a grant from the Defense Advanced Research Projects Agency. Then there’s this one, which looks more like an enormous, six-propelled pressure cooker. 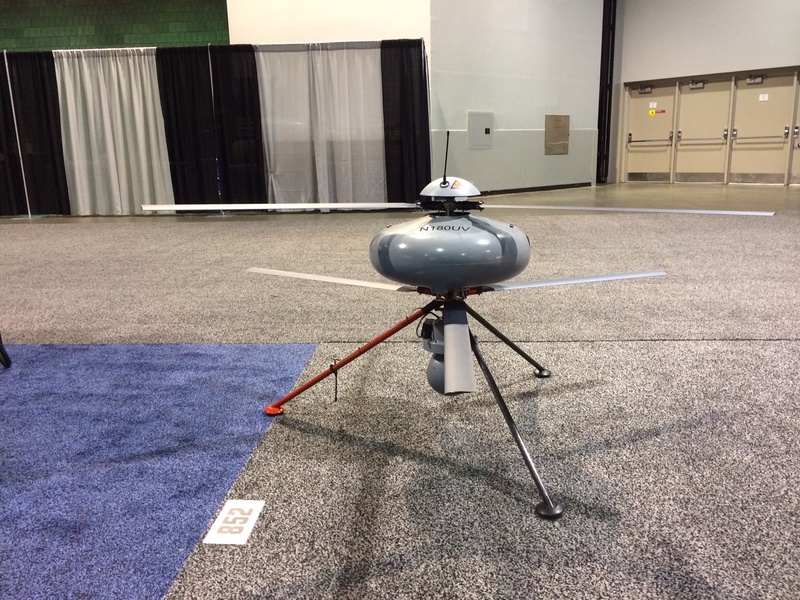 Reference Technologies is marketing this Hummingbird II for airborne delivery and situational awareness. It has a ceiling of 14,000 feet and a top speed of 60 mph. Hummingbird II from Reference Technologies. Defense One was on hand to view the Indago demo. No, it’s not the most creative-looking design, but the Indago requires much less setup time than many other commercial quadcopters. It’s far quieter and more rugged but — starting at $48,900 — also more expensive than similar consumer drones. Indago has not undergone full US Military Standard Environment testing but the perceptor sensor package affixed to the bottom has been mil-speced. 4. 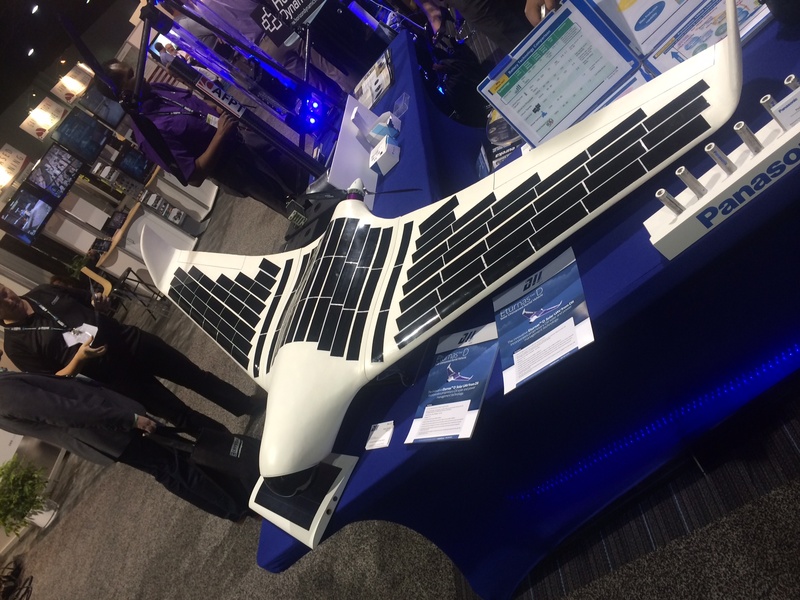 The Eturnas D , a semi-solar-powered drone from DII, has a seven-foot wingspan and weighs just 10 pounds. 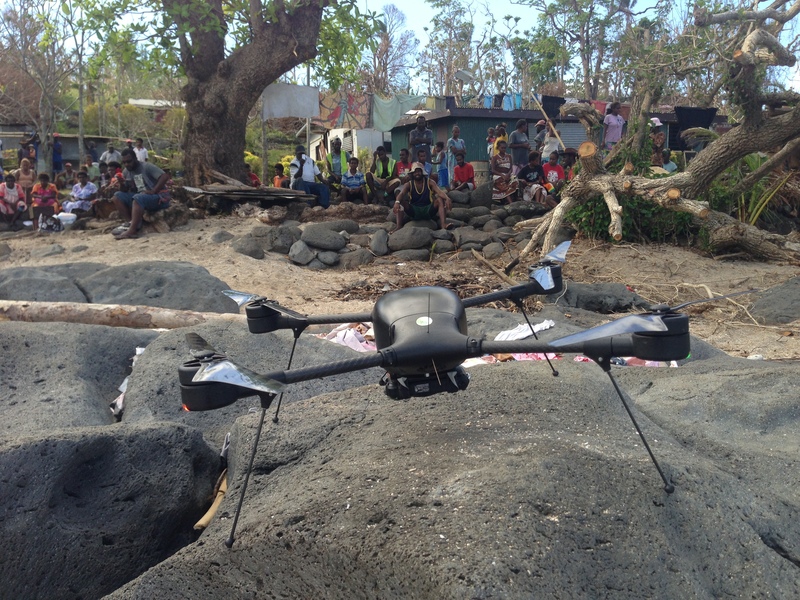 Solar-powered drones aren’t new, but integrating them into new frames is an ever-evolving art. The Eturnas can fly for six hours at 27 mph or 1.2 hours at 45 mph. 5. The diesel-powered TANAN , marketed by Airbus Defense and Space, represented here at about one-quarter its actual size, stands 17 feet long and 6 feet high. It requires one operator, looks like something from a Saturday morning cartoon show, can carry a maximum payload of 176 pounds, and can reach 93 mph—but not all at the same time. 7. The flying disc-shaped Radeus from Radeus Labs features two sets of counter-rotating blades. During vertical lift, the blades spin at 60 mph, pulling the saucer off the ground. But when the drone moves forward in the air, the top portion of the vehicle converts to an autogyro. Its maker, Ray Hayden, says that he’s achieved the vertical lift portion on a similar model but not this one. He came to Atlanta seeking partners and investors. 8. The ECA/ Infotron IT 180 features a strange looking counter-rotating propeller design, giving it the appearance of a spinning top or, perhaps, a mutant dragonfly. The electric version is good for an hour’s flight before recharging and reaches a ceiling of 14,700 feet. 9. 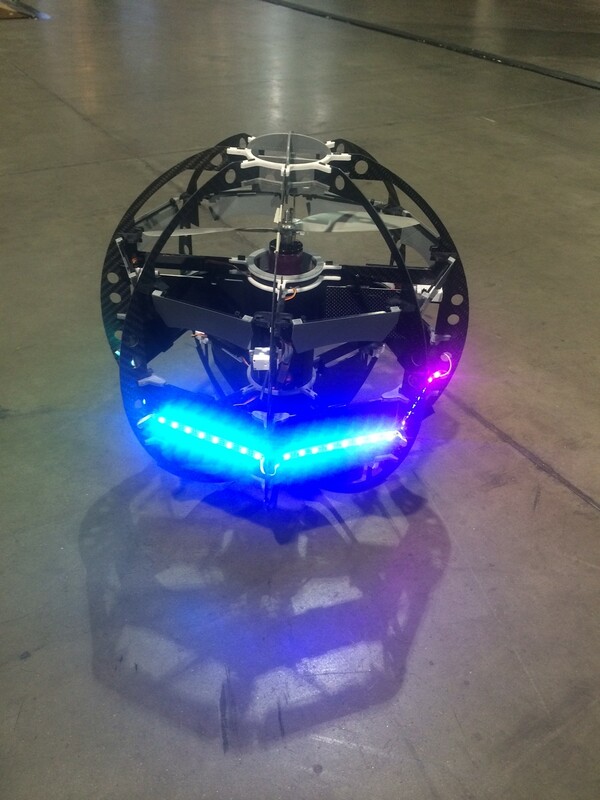 Looking like a cross between the IT-O interrogator droid from Star Wars and a disco ball from hell, the All-Terrain Land and Air Sphere, or ATLAS , from Unmanned Cowboys is a rotorcraft with a spherical “exoskeleton.” The frame protects it when it crashes and enables the operator to adjust it and put it back into flight without touching it. (See video below). It’s ideal for those situations when you may want to throw a drone into a room to collect intelligence but don’t want to go in and pick it up when you slam into the doorframe. 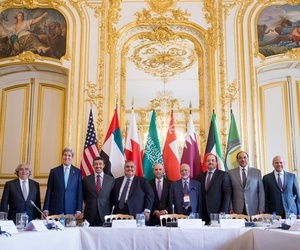 White House meeting with Arab leaders looking shaky; Time for the Carter Doctrine? 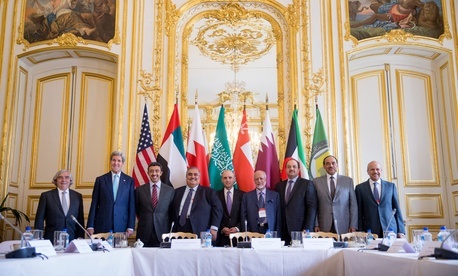 ; Disco ball drones; ISIS at a crossroads; And a bit more.